You pay a premium for GreenPower and it has a direct impact on demand for renewables in Australia (your mum would be proud) but what does this actually mean? Because it’s impossible to tell where the electrons delivered to your home are coming from (hence why we are 100% carbon neutral – read more), we can’t guarantee your electricity is coming directly from a renewable generation source. 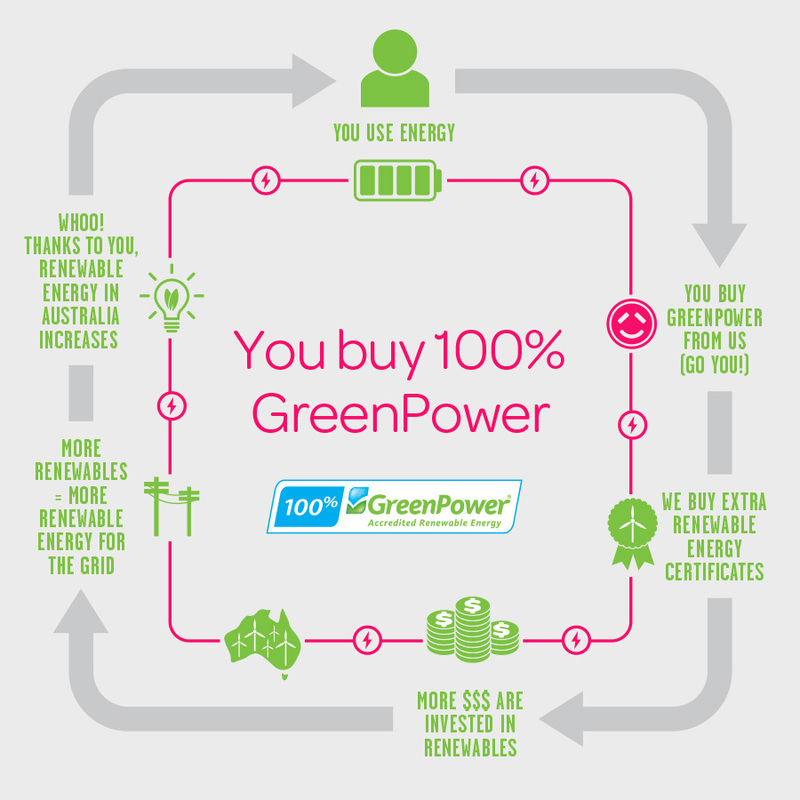 So, to help our customers support Australian renewables directly, we offer you the option to purchase GreenPower. GreenPower is a voluntary government accredited program that allows Australians to displace their standard electricity usage with certified renewable energy, which is added to the grid on their behalf. When you buy GreenPower, we then purchase the equivalent amount of Renewable Energy Certificates (RECs), which means more dollars are invested in renewable energy projects, which leads to more renewable energy for the grid! In 2015, the amount of GreenPower our residential customers bought was the equivalent of operating more than three additional 2MW wind turbines for an entire year. From October to December last year, 23% of Powershop customers made a GreenPower purchase. This is about six times more than the industry average. Powershop is the only energy retailer to give customers complete flexibility as to how much GreenPower they choose to buy. In each quarter of 2015, the proportion of Powershop customers purchasing GreenPower increased, which goes to show the value in giving customers greater choices in how they support renewable energy. If you only want to buy GreenPower, you can set this as your default product in your online account settings. This can be changed whenever you like. Log into your account, select the GreenPower pack you’d like to purchase, enter the units you’d like to buy and checkout. You can do this whenever you like or whenever it fits your budget. 2 comments on "GreenPower: Everything you need to know"
Thanks, but I’m looking for some further clarity & reassurance as a long term 100% Green Power customer now reconsidering my options. As I understand, all my PS electricity is now carbon offset and hence net “carbon neutral”. I can choose to pay more to support additional renewable energy in the grid (and have been doing so for years), but now I’m wondering why should I do that if I can simply neutralise my usage with carbon offsets? Hi Shawn, you’re correct! We carbon offset all of the energy at your home at no extra cost to you because its the right thing to do. Our customers have the ability to purchase Green Power to support renewable energy in the grid (as you have mentioned) but this choice is completely yours. It’s great to know that regardless your usage will be offset by us!